Enable your intelligent automation platforms with new and advanced cognitive skills. Are you ready for the new digital workplace? Add text extraction, document conversion and classification to your software by integrating premium OCR technology. Help digital workforces understand and create meaning from enterprise content. Capture content from document images and photos via tablets and smartphones. Document capture and text analytics to cut costs, drive revenue, and mitigate risks. OCR, ICR, OMR, OBR, and document imaging SDK. Edit, convert, and compare PDFs and scans with PDF and OCR software. OCR, ICR, OMR, OBR, and document capture to ERP and ECM systems. 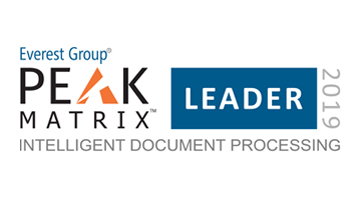 Leading consulting and research firm, Everest Group names ABBYY as a Leader in its latest Intelligent Document Processing Products PEAK Matrix™ Assessment 2019.